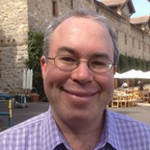 Guest post by Arlin Wasserman, founder and partner, Changing Tastes. The views expressed here are solely those of the author and do not reflect the views of Food+Tech Connect. Dining is different than just eating, where we consume so we can keep on, what we know how to cook and sadly, we what we usually eat. But many people in the U.S. are fortunate enough to be able to choose dining over eating pretty often. More than ever as a nation, we’re deciding where to eat before we decide what to eat, and we’re paying culinary professionals more than ever before to assemble and transform ingredients into something delicious. We now spend more than half our food dollars to have culinary professionals and food companies cook for us. Grocery shopping is going the way of the landline. But some supermarkets are making the move to reinvent themselves as sit down and take out restaurants, complete with buffet selections and self-serve pay stations instead of wait staff. Despite the move from bags and carts to plates and to-go containers, we still go to grocery stores to eat not to dine. A really good grocery shopping experience is rarely as enjoyable as a really good dining experience, and it rarely surpasses some minimum standard of yummy,SM and holding far few surprises. Look at what I’m interested in, where I’ve been, and what I like and don’t like. Point me not in the direction of the restaurant that most people like but towards the one that shares my interests and values. Point me towards the one that has the flavors and recipes that I haven’t had but discern that can be discerned by putting my palate, my preferences and maybe even my grocery shopping list through a virtual robot-coupe. Building off the software programs that now help restaurants develop new recipes based on emerging and trending flavors, maybe this new technology could even let the chef know what flavors are emerging or trending in Arlin. In an era of increasing customization and millions of possibilities, I need help deciding where to eat. But don’t ask me to choose. 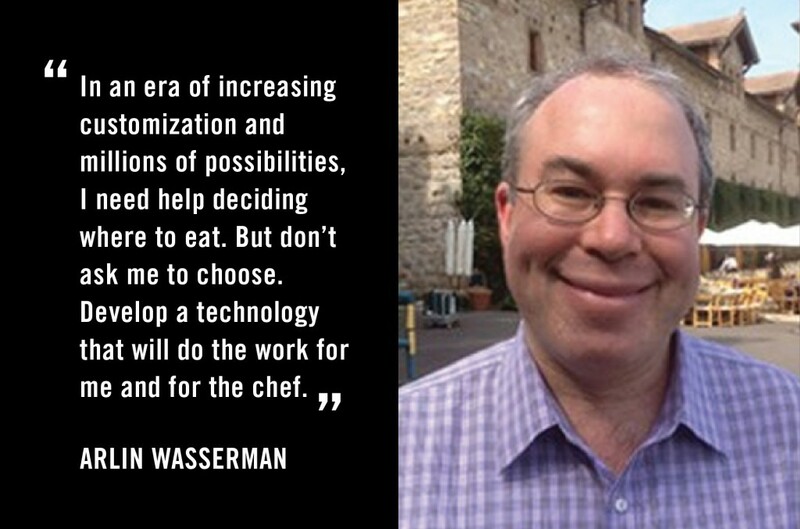 Develop a technology that will do the work for me and for the chef. This way I can be surprised by something I didn’t know I wanted until I experienced that first wonderful bite. Hacking Dining is an online conversation exploring how we might use technology and design to hack a better future for dining. Join the conversation between June 2 – July 31, and share your ideas in the comments, on Twitter using #hackdining, Facebook, LinkedIn or Tumblr. Arlin Wasserman is founder and partner at Changing Tastes. Changing Tastes is a consultancy that finds value and opportunity at the intersection of the five major drivers of change in our food system: sustainability, public health, information technology, demographics and the changing role of the culinary professional. The firms insights are the basis for the strategy, innovation, sustainability and performance management services it provides to Fortune 100 and growth stage food companies, government sector and private investors, and civil society institutions. Arlin also is a fellow at the Center for Leadership in Global Sustainability at the Virginia Polytechnic University and chair of the Sustainable Business Leadership Council for Menus of Change, a joint initiative of the Culinary Institute of America and the Harvard School of Public Health. Arlin previously served as Vice President of Sustainability at Sodexo, the world’s largest institutional foodservice company, and was awarded a fellowship at the Aspen Institute and a Food and Society Fellowship funded by the W. K. Kellogg Foundation.